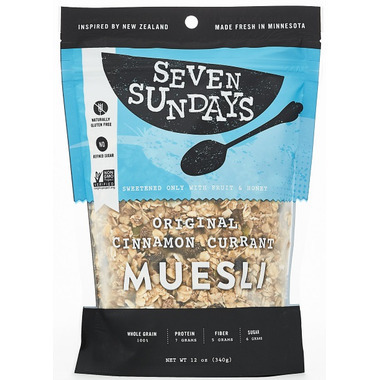 The Original (Cinnamon Currant) Muesli is the very first recipe Hannah crafted, and the closest she could get to the cherished homemade mueslis she and Brady enjoyed in New Zealand. It’s a hearty blend livened up with unexpected ingredients like Brazil nuts, bananas and coconut and cardamom. Our favorite way to enjoy it is served straight out of the bag with cold milk and fresh berries. 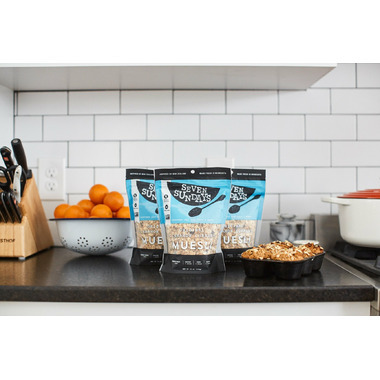 Ingredients: Gluten-free oats, sorghum flakes, buckwheat groats, currants, unsweetened coconut chips (no sulfites), organic honey, almonds, Brazil nuts, flax seeds, sunflower seeds, dried bananas, pumpkin seeds, spices. Made in a facility that uses dairy, eggs and soy. May contain pit or shell fragments.